These delicate almond lace wafer cookies have a wonderfully light crisp texture and can easily be made gluten free. Dip them in chocolate or leave them plain, they’re always a hit! VINTAGE VIEW ~ these Almond Lace Wafers are from TVFGI archives, first published in 2015. I’m reviving some of the best recipes that you may have missed over the years ~ these cookies were part of my fun Reader’s Recipe series where you guys submitted your favorite holiday cookies. This one looks like it would be tricky to make, but it’s not! 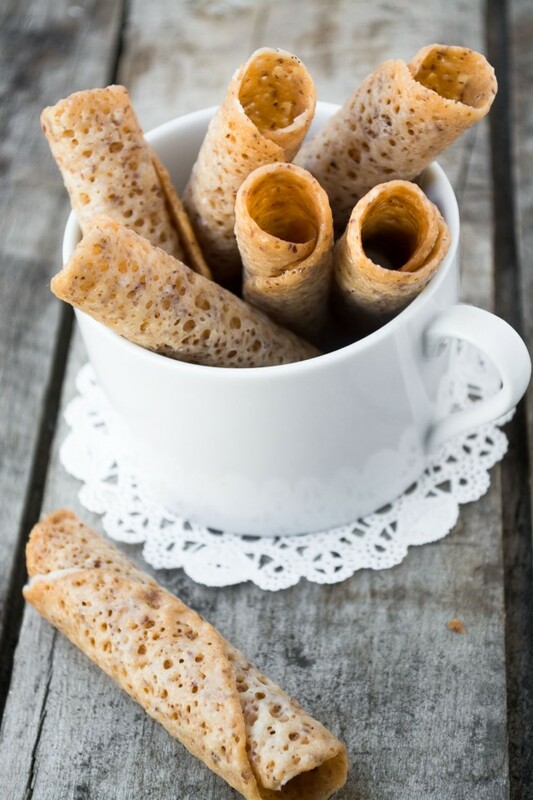 Today’s recipe for beautiful Almond Lace Wafers was sent in by Donna, who lives in Carmel Indiana. This was her mom’s recipe, and it’s been a beloved Christmas tradition for her since she was a child. 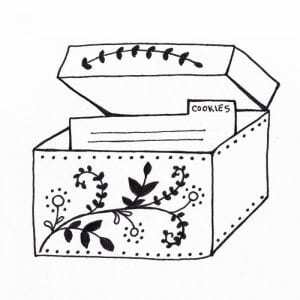 I hear it again and again in your emails to me, these cookie recipes that you send in represent treasured holiday memories, and the ritual of making of them year after year is an important part of your lives. Like all of the other cookies I’ve shared, these are incredibly delicious, too, and I have a feeling that after this post there’ll be a lot more people out there who’ll want to incorporate them into their own holidays. In her note to me, Donna called these cookies “fragile, beautiful, and delicious.” I couldn’t describe them better. They have a lovely almond toffee flavor, with a snappy crispness. The batter is very thin and spreads out in the oven to make the lacy appearance. 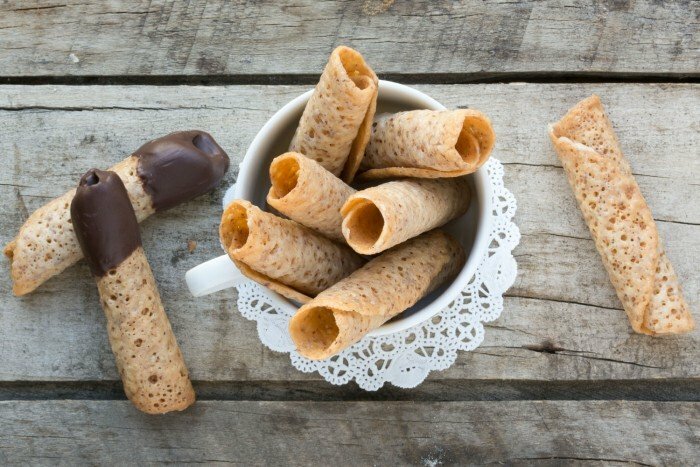 They flat cookies are cooled for a minute, then rolled around the handle of a wooden spoon to form little tubes. The toffee candy flavor and crunch comes from the butter and sugar caramelizing in the oven. While the recipe calls for grinding almonds I used almond meal and it worked great. It’s a nice thing to have around for holiday baking, I keep it in the fridge to preserve the freshness longer, because nut meals can spoil quickly. Using the pre-ground almonds really makes this cookie a snap to put together. The rolling of the fresh-from-the-oven cookies was surprisingly easy and not as fussy as I’d feared. You’ll need the handle of a wooden spoon, or something similar, to roll the warm cookies around. They cool down and hold their shape immediately so you can move right on to the next. Donna says her mother was of Swedish heritage, and that makes sense since these cookies are definitely Scandinavian in origin. You can leave them flat if you don’t want to roll them, and I couldn’t resist dipping a few of them in a little dark chocolate. I was really happy with this recipe, but I guess I should expect that by now, every cookie in this series has been a slam dunk. In the past I’ve had lace cookies that were either too delicate, or too greasy, but these were just perfect. They’re thick enough to hold together and have some body, but still incredibly light and crisp. Get everything organized before starting because it’s a quick process with steps that need to be done promptly. Locate a wooden spoon with a slender handle, even a round chopstick would work. Prepping the baking sheets is key — be sure to grease or spray them, and then dust with flour. I re-dusted with flour a couple of times. I did try my silicone mat but it did not work as well as the greasing and dusting, fyi. While it sounds a little bit hectic to have to remove the cookies at exactly the right time, let them cool for a minute, then flip and roll them, all before they harden, I found it was really easy and problem free. The warmth of the cookie sheet keeps the cookies pliable enough while you roll them, I never had to put them back into the oven to soften. It helps to do a test cookie or two to make sure your oven is set correctly, etc. For easy chocolate dipping, put a cup of chocolate chips in a pyrex measuring cup and microwave for 60 seconds. Stir until melted and smooth. Zap for a few more seconds if necessary. Dip half of the cookie into the chocolate, shake off excess, and lay on parchment to firm up. It helps to put them in the refrigerator to speed up the process. There are sheet pans, and then there are sheet pans. I used to use cheap sheet pans that warped and twisted and burned the bottoms of my cookies. Then I tried USA pans and realized that there is a difference. These pans have no bells and whistles, they’re just good solid durable cookware. A set of two will see you through many years of holiday cookie baking. USA makes a whole line of bakeware and I’m slowly replacing all my pans. Plus, they’re made in the USA! 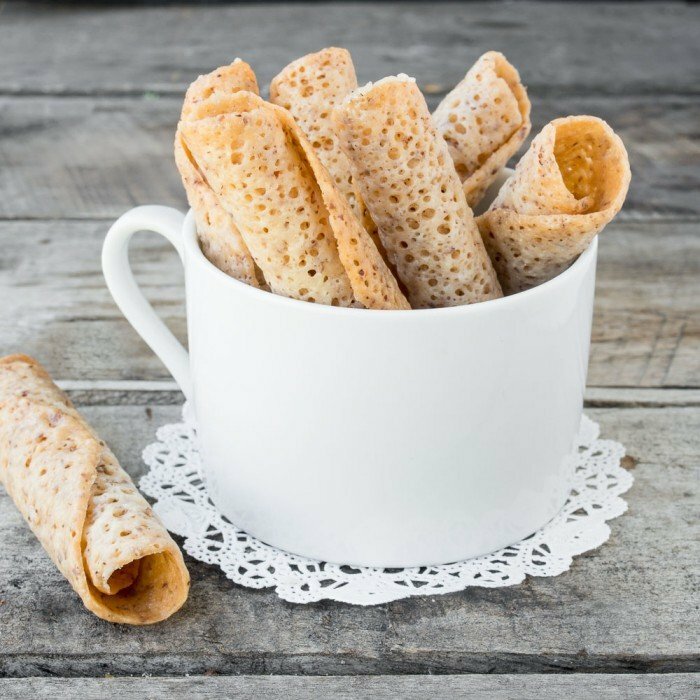 These delicate almond lace wafer cookies are gluten free and have a wonderfully light crisp texture. Dip them in chocolate or leave them plain, they're always a hit! Grease and flour 2 cookie sheets. Put the ground almonds or almond meal into a saucepan. Mix in all remaining ingredients. Cook over low heat until butter melts, stirring constantly. Batter is very thin. Drop by teaspoonfuls onto the prepared cookie sheet, only 5-6 at a time as batter will spread. Bake 7 to 9 minutes or until a light caramel color, with centers still bubbly. Watch very carefully so as not to overbrown. Let cool for 1 minute, then immediately transfer, UPSIDE DOWN, to waxed paper. Working quickly, immediately roll each cookie quickly around the handle of a wooden spoon, forming a loose cylinder. If cookies start to harden, return to oven for 1 minute to soften. These cookies are quick cooking but since you need to do them in batches, the whole process will take about an hour. 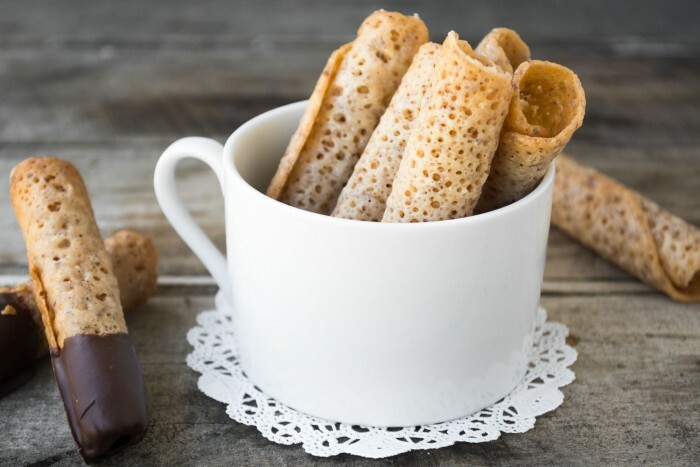 Make these almond lace wafers your own! Make them gluten free by substituting gluten free flour for the regular flour. 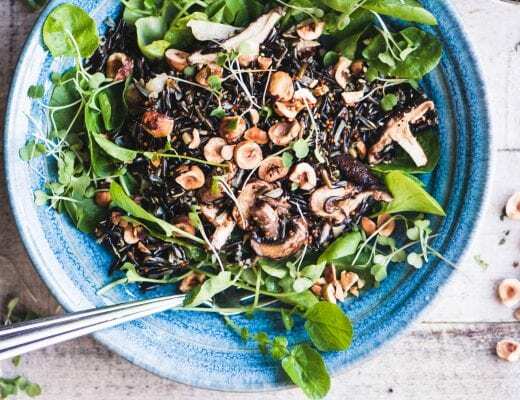 You can substitute other varieties of ground nuts for the almonds, I think pecans, walnuts, or hazelnuts would be great. 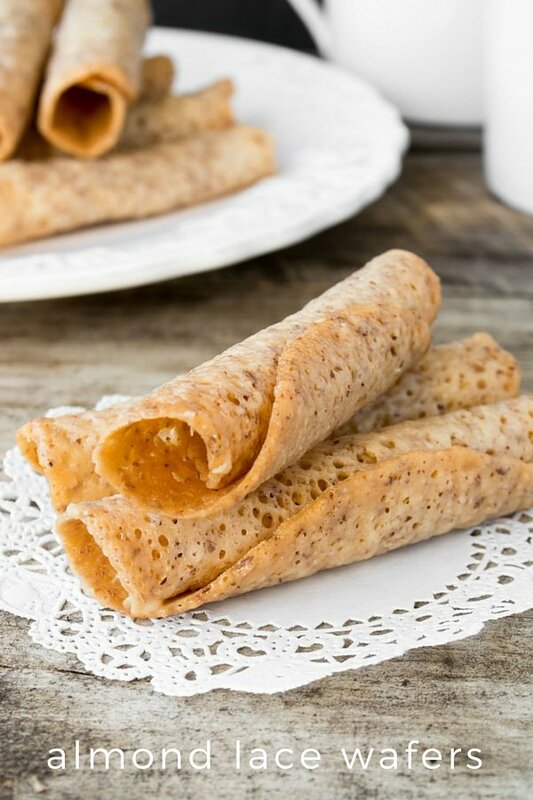 You can also make these with oatmeal! Dip them in white chocolate. Double dip in sprinkles or nonpareils for a pretty effect. 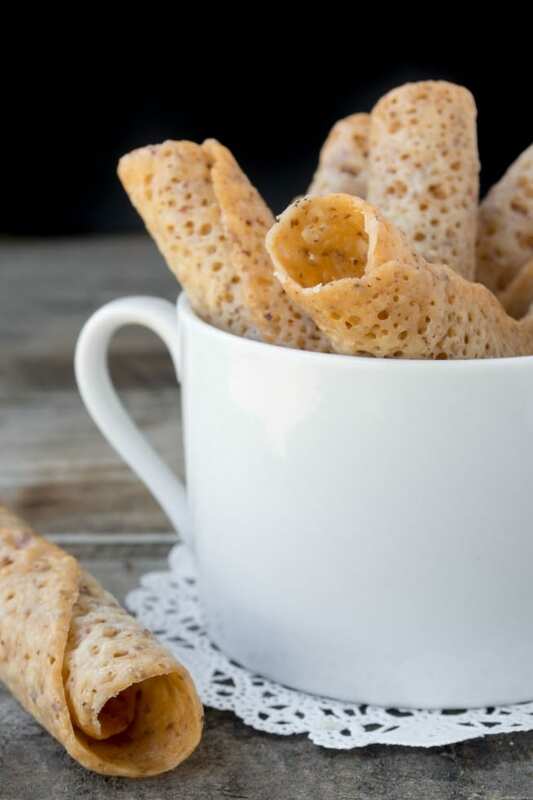 Don’t forget to pin these Almond Lace Wafers! That should work fine Claire. I tried to make this twice, but each time, I couldn’t roll them around the handle of a wooden spoon ! What shall I do in that case ? It sounds like they were too cool, Heba. Next time be sure to roll them sooner. You might try putting the cookies back in the oven briefly, they might soften enough to roll. 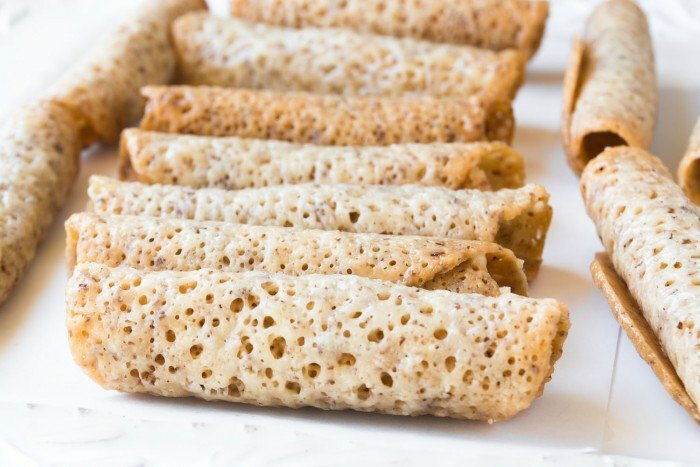 I had almond lace tuile at a potluck party and the person who make it stuffed it with some kind of cream. It was absolutely delicious. I’ve looking for the recipe for both the cookie as well as the cream stuffing recipe ever since. Do you by any chance have recipe for the cream stuffing? I don’t, but you might try searching for a basic pastry cream, Rubina. You would need to substitute another granulated sugar product, not honey, in this recipe, to keep the correct structure to these cookies. I’m not sure about the almond milk substitution because I haven’t tried that, sorry Jack. Wondering if you could use parchment paper to line the pans? I just made these with pecans as I’m not an almond fan. They are absolutely delicious!! I found lining the pan with parchment paper worked the best. I would LOVE to try these with pecans, that sounds really wonderful. Sue, Any ideas for making this vegan? 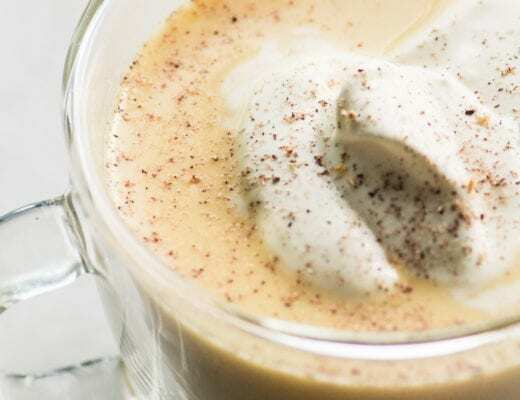 You might try coconut oil and coconut milk for the butter and dairy milks. Although these tasted delicious, I found these ridiculously hard to make. I followed the recipe exactly but the first batch burned in only a couple minutes and never did spread out. They were way too small and thick to consider wrapping them around a spoon handle. I manually spread out the second batch and watched them like a hawk and took them out before they burned only to have them completely fall apart when transferring. By the time I got to the third batch the butter oil had separated from the rest of the batter and they don’t seem like they are baking well because of it. It’s a shame. Have you checked your oven temperature Anna? It sounds like that might be the problem, these work like a dream for me. This does NOT work when using pecans instead of almonds! That’s good to know Theresa. I’m surprised, i would have thought that if they were finely ground like the almonds, that pecans would work! Yes, I would use the oats. The tablespoon of flour is very small, but I think it does serve to bind together the thin batter. 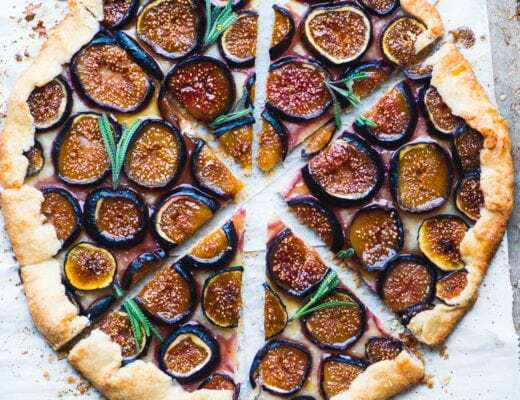 I just bought almond flour and wondering if it would work in this recipe, and also whether I could sub half and half for the milk and cream. Thoughts? I’ve not made these cookies before. I used Trader Joe’s almond meal and it worked great, I assume your almond flour would work, too, Tammy. I think the half and half would be ok, as well. Good luck! Hi Sue, I’m entertaining this weekend and would love to make them in advance! How long did yours stay fresh in the fridge for? They look incredible!! Hey Danielle, as I recall they kept pretty well, I’d say you could make them a day or two ahead of time. I’ve heard straight from Donna that these cookies should not be stored in the fridge or in a plastic container or they will get soft. They need to be stored in a tin or metal container so they stay nice and crispy. They’ll keep for quite a while this way – at least a week. Hope this helps! These were more challenging than I thought they would be. The key is to only put only a teaspoon or two of batter on the baking sheet. They spread far and wide! Mine turned out to be very brittle. Too much so for my liking. I found them messy to eat. I’m sure I did something wrong – I’m not much of a baker. Sorry they didn’t work for you Heather, they might be slightly more challenging for a beginning baker. They should be pliable enough to roll, it sounds like maybe they got baked a tiny bit too long? In the notes you mention that this recipe can be made with oatmeal. Would you replace the nuts with oatmeal, or do you add oatmeal in addition to almonds? You would use oats in place of the nuts, Martina..
Greetings. Tried your lace cookies and the flavor was awesome. Mine didn’t form it was like a crumble over an ice cream. Don’t know what I did wrong. Did you get them right off the baking sheet when they came out of the oven? I found they hardened up very quickly so you have to form them around the spoon handle right away. Oh my, but this is one of my favorite cookies, and I always try every recipe I see. This one is next on mt “to do” list. Thank you for posting this one. Hi Sue. I’ve always wondered why some recipes specifically call for unsalted butter over salted. Can you clarify that for me? Hi Janet — it’s just that there is quite a bit of salt in salted butter, and for baking it makes sense to use the unsalted so you know exactly how much salt is going in your recipe. When baking recipes don’t specify, they really mean UNsalted. Almond Lace cookies are my all time favorite. These have to be sensational if they’ve been passed down over the years. I’ve printed the recipe to try and dip into the chocolate. I can vouch that these were DELICIOUS. Taste like toffee! What a lovely recipe! These would be so perfect with coffee or tea. I’d love to try making these and I love your chocolate dipped version! These look so crispy and delicious. I’m going to start baking soon! Lovely! I look forward to giving the recipe a try. Thanks! oh these just look PERFECT and dipped in chocolate, oh yes please! Such pretty cookies, I’d dip them in chocolate too! These cookies look delicious, Sue. I make a variation these lace cookies—they are one of my family’s favorites. I can eat every single one of them right now! They’re so light and airy it’s easy to get carried away! These are picture perfect, Sue! Too funny that the recipe comes from someone who lives just minutes north of me!!! These almond lace cookies are one of my favorites! I love the crunch and the caramel-nutty flavor. Kudos to you for rolingl them so beautifully. I always struggle with that! Come Christmas time, I want to dip every cookie in chocolate. These are perfect! Those almond wafers look gorgeous, Sue. You did a great job creating those beauties. Thanks Angie, they were a lot easier than I imagined! Wow – these are gorgeous! I love these kind of cookies and I bet the chocolate dipped version is wonderful too – love the photos – beeeeautiful! Beautiful pictures and gorgeous cookies. They look so elegant! I love that you can dress them up with chocolate or leave them plain and simple. So glad I hopped on your blog this morning! These look elegant, delicious and simple. Thanks for sharing, as always. I hope you had a wonderful week! Thanks Pam — these are so addictive I’m having one (or two) with my coffee!